Bradford City have signed Falkirk pair Mark Stewart and Chris Mitchell. Stewart, a 23-year-old striker, has signed a two-year-deal, while 22-year-old Mitchell, a defender, has agreed a one-year-contract. Manager Peter Jackson told the club website: "Mark Stewart is a really exciting prospect and can score a variety of different goals. "Chris Mitchell is very versatile and can easily play right back or left back," Jackson added. "He could also do a job for us at right midfield or central midfield, so he can fill at least one or two positions for us. "His presence in the squad will be a real benefit for us given his versatility, and he is extremely hungry and determined to succeed in England. " Stewart finished as top scorer for Falkirk in the Scottish first division last season, scoring 17 goals. "He has a lot of pace and can easily play down the middle or out wide on either side," Jackson said. "I've seen him score goals with his left foot, right foot and his head." 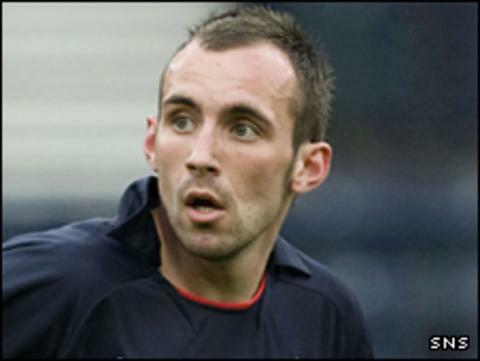 A former Celtic youth-team player, Stewart moved to Falkirk in 2006 and went on to make 90 appearances for the club, 42 of them in the Scottish Premier League. Mitchell also appeared for Falkirk in the top flight and has been capped seven times by Scotland at under-21 level. The club, meanwhile, have appointed Wayne Allison to the coaching staff. The 42-year-old was a player at Huddersfield during Jackson's tenure at the club.